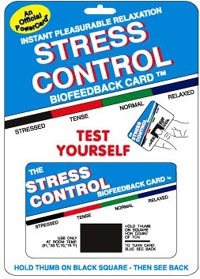 EVERYONE HAVING ANXIETY CAN BENEFIT FROM THE STRESS CONTROL BIO-FEEDBACK CARD. IT MAKES RELAXATION TRAINING FUN AND INEXPENSIVE. Credit card size with black square that changes color on touch. Relaxation techniques on back help turn card blue (most relaxed). Builds in automatic relaxation response when stressed. Lessens anxiety-caused headaches, HBP, insomnia, smoking, overeating. 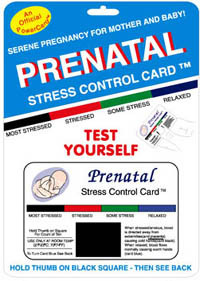 STRESS CARDS FOR PRENATAL CONTROL HELPS INSURE A HEALTHIER BABY AND GIVES MOM MORE PEACE OF MIND. Card is credit card sized w/black square changes color on touch. Relaxation techniques on back help turn card blue which means most relaxed. Too much anxiety during pregnancy is a major risk factor, can lead to underweight, premature, low IQ child and heart disease in adulthood. SPORTS WINNER IS AN INEXPENSIVE PORTABLE BIOFEEDBACK DEVICE TO TRAIN ATHLETES TO BE MORE RELAXED AND EFFECTIVE IN THREE MAJOR WAYS. Card is credit card size with a black square that changes color on touch. Relaxation techniques help turn card blue indicating a most relaxed mode. Iimproves sports ability 3 ways: first it relaxes, second it increases confidence, and lastly it helps positive visualization. BATH THERMOMETER HELPS EASE PARENTS' CONCERN ABOUT WHETHER THEIR BABY'S BATH WATER IS TOO HOT OR TOO COLD. Place card under water in baby's bath. When temp. is just right (between 96.6° and 100.6°F) a cute little bear will appear in green. First use hand or elbow, then use card to confirm. 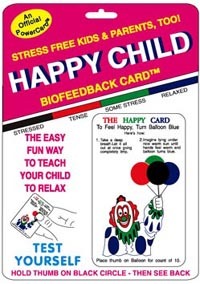 HAPPY CHILD BIOFEEDBACK CARD IS AN EDUCATIONAL TOY THAT TEACHES A CHILD TO RELAX. BEATS RITALIN. Creditcard sized with black circle that changes color on touch. Fun way for a child to learn relaxation. When the child starts to act up challenge him/her to turn card blue. Simple relaxation techniques make it easy for a child to do. HEADACHE BUSTER CARD IS AN INEXPENSIVE PORTABLE BIOFEEDBACK DEVICE TO HELP ELIMINATE CONSTANT HEADACHES. BEATS ASPIRIN. Credit card sized with black square that changes color on touch. Practicing relaxation techniques on back of card until card turns blue will prevent headaches. Card helps relaxation and becomes automatic when stressed. EVERYONE IS CURIOUS TO KNOW THEIR OWN OR ANOTHER PERSON'S PASSION LEVEL. PASSION METER IS SURPRISINGLY ACCURATE. The more relaxed you are the easier your passion can come out. Card indicates one's potential passion by measuring stressor level. Card color changes on touch according to fingertip temp. (Warm hands give off more heart). Great ice breaker at parties! HUG METER BIOFEEDBACK CARD IS THE FUN AND EASY WAY TO GET NICE WARM HUGS. COLOR ON TOUCH TELLS HOW MANY HUGS YOU GET. When stressed everyone could use a hug. Card color on touch indicates how many hugs you get (the more stressed, the more hugs). A great ice breaker at parties. THE FAT BUSTER CARD IS AN INEXPENSIVE BIOFEEDBACK DEVICE THAT HELPS TO CONTROL WEIGHT IN 4 WAYS. Helps eliminate overeating in four ways: decreases anxiety; increases control (willpower); gives pleasure; helps program in new positive habit. Color change on touch indicates lowered levels & greater control after relaxation techniques on back of card. THE SMOKE BUSTER IS AN INEXPENSIVE BIOFEEDBACK CARD THAT HELPS ONE BREAK THE SMOKING HABIT IN FOUR WAYS. Helps eliminate smoking in four ways: decreases desire; increases control (willpower);gives pleasure; helps program in new positive habit. Color change on touch indicates lowered anxiety & greater control after relaxation techniques on back of card. To order these retail cards, please call us at 1-310-897-5055 or email us at Sales@SPCcenter.com with the information requested in the form above. If you have a PayPal account, you may use PayPal's service with our account name, StressCard@AOL.com, as the payee. Lynn A. Lacey, Ph.D., Director Common Visions, Brookdale, CA. “Please accept my appreciation for developing a practical and simple to use method of determining and controlling stress [The Stress Test Handbook & Biofeedback card] I have read many books on the subject and attended many seminars conducted by experts in the field. Your booklet covers the entire field of stress education and also provides easy and effective ways to reduce stress. All of this in only 14 pages! The Biofeedback Card is amazingly accurate. I use it in my work as an industrial nurse to demonstrate to my patients that their stress level can be lowered by practicing these techniques. They are impressed at how much better they feel when they are in the blue. The card is as accurate as some of the Biofeedback machines I have used which cost several hundred dollars. The company where I work is purchasing a card and book for each employee. Thank you for caring enough to devote the time and effort you did to develop this most useful tool”. “I want to let you know how very useful I have found your hand-held, credit card size, biofeedback device. In addition to the self-programmed control techniques from your book, I have been using this card to retrain people suffering from stress-prolonged psycho-physiological illnesses. In addition to excellent results with those with high blood pressure, ulcers, colitis and agoraphobia...I’m finding equally rewarding responses in the psychological treatment of cancer patients, especially those wanting to use the Simonton method of imagery. It is truly exciting to see the rapidity and convenience with which this little card teaches the users to monitor themselves and initiate stress-reduction techniques without expensive and time-consuming trips to their doctors or biofeedback laboratory. Thank you for developing such a useful addition to the therapist’s treatment armanentarium, and one so useful in so many modalities”. Over one billion of these cards have been distributed world wide. Largest users have been: the government and the armed forces; employee assistance wellness programs; companies wishing to give a valuable promotional gift to their client; professionals in the helping fields; and HMO’s such as Kaiser, Blue Cross Blue Shield, Cigna, and FHP.